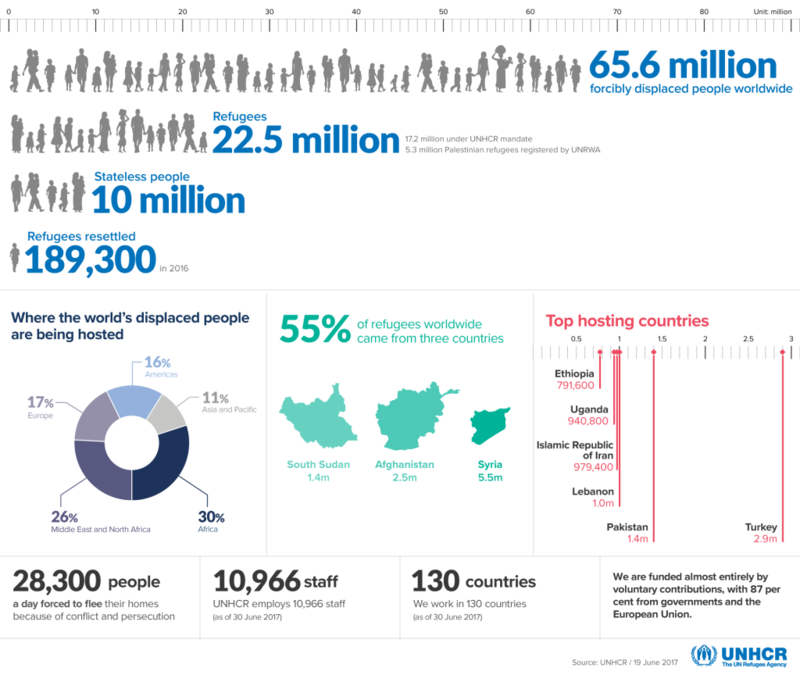 There are currently approximately 65.6 million people across the world who have been forcibly displaced from their country of origin, of which 22.5 million are recognised as refugees. According to UNHCR figures 28,300 people are forced to leave their homes daily, because of conflict or persecution where they are current living. People from Syria make up the largest nationality proportion of people on the move (5.5 million), followed by Afghans (2.5m) and South Sudanese (1.4m). Over half of the 22.5 million refugees are under 18. Women and children who have been displaced are more vulnerable to trafficking, abuse and exploitation whilst on the move, especially if they do not have documentation which allows them to get access to services in certain countries – forcing them to take risky routes to travel or find shelter. In transit and final destination countries, displaced people and their families find they experience discrimination, poverty and social marginalisation. Access to services, such as healthcare and education can be difficult, and sometimes its not guaranteed that they will be able to continue living in that country. Cricket Without Boundaries, coaches and provides coach education to refugees and displaced people on projects in Kenya, Uganda and Rwanda and has seen how cricket (sport) can be used to bring together people to enjoy being active and receive messaging on gender equality and HIV/AIDS. With this background, we are now working with organisations in the UK and overseas, who either use cricket or sport as a way for asylum seeking or refugee children and young people to get support and advice of how to access services, and be a safe place to meet and play with friends.